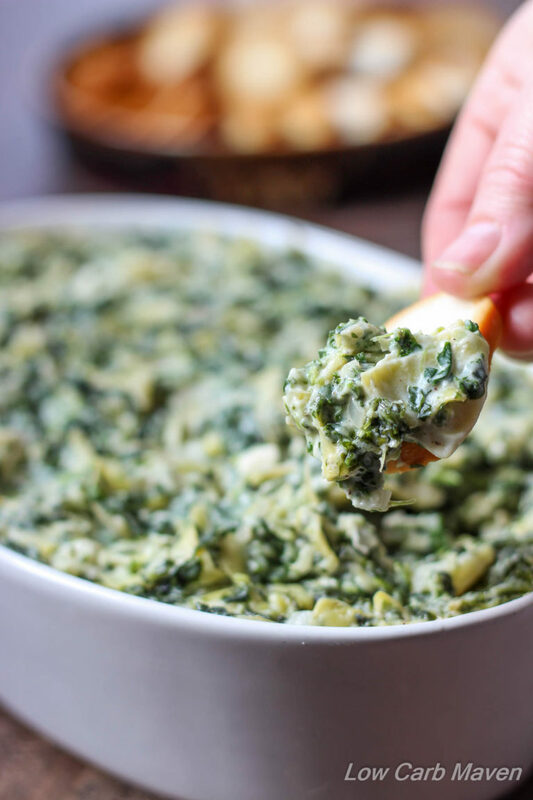 The BEST cheesy Spinach Artichoke Dip! This low carb dip comes together in minutes in a pan. It’s perfect for your low carb, ketogenic gatherings and is gluten-free. I know I’m not the only person looking forward to New Year’s Day and then the Super Bowl. Not only are there plenty of football games on television, to my son’s delight, but snacks and appetizers reign supreme. We love appetizers! We love snacks! We love chips! 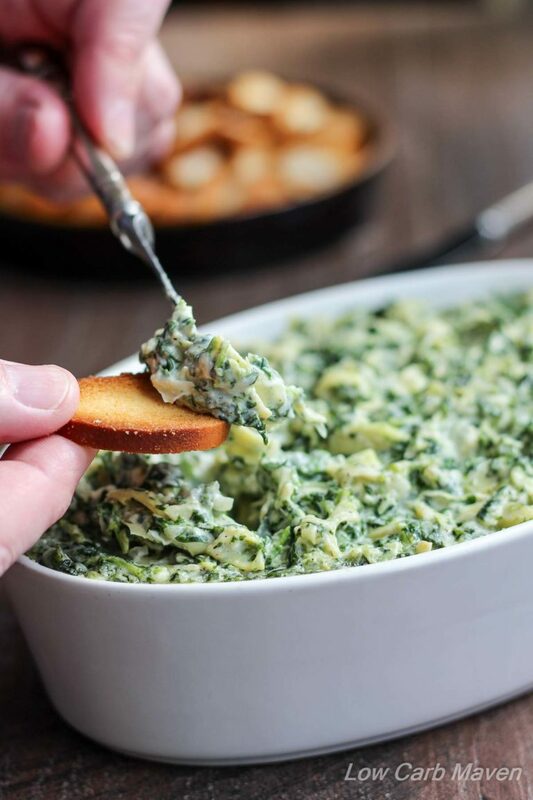 We love artichoke dip; especially this low carb spinach artichoke dip! I really and honestly feel that this is the BEST TASTING DIP AROUND! My family thinks this is super. We’ve tested it on low carb bread, low carb crackers, veggies and spoons. Even the picky kid likes it. I like it because it’s fast and easy to prepare. 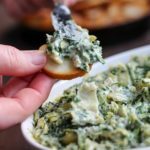 BEST Low Carb Spinach Artichoke Dip! When doing research for this particular recipe, I noticed that most spinach and artichoke dips share common ingredients in differing amounts. It’s a forgiving recipe ready for additions and substitutions. I kept many of the ingredients for this recipe the same, but played with the quantities until I had something close to what I wanted. The addition of feta cheese contributes a nice salty tang. A very-dry sherry provides subtle sophistication (think fondue) while a hint of red wine vinegar heightens the over-all flavor. While the ingredient list seems long, it mostly consists of cheese, spinach and artichoke hearts. The other ingredients contribute to creaminess and outstanding flavor. One thing I really appreciate is good flavor and I strive to deliver the best tasting recipes I can. Why eat it if it doesn’t taste great? This recipe is fairly large (4 plus cups) and can be easily scaled in half for smaller gatherings. However, it is so good and versatile that you may want to make the whole quantity! Just an FYI… I have some recipes incorporating this great low carb spinach artichoke dip in the next few weeks. 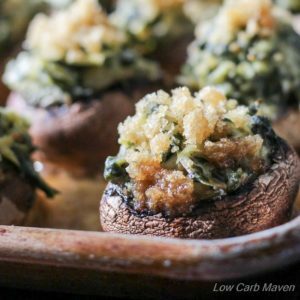 Try the 2-Bite Spinach Artichoke Stuffed Mushrooms! Last: Fold and stir in the spinach and artichoke hearts and heat until warmed through. Serve. Options: At this point it can be served, put into a oven proof casserole dish and placed into the oven, refrigerated until needed, put into a crock pot and kept warm or stuffed into mushroom caps. Makes about 4 cups with 1/4 cup per serving. Previous Post: « “Mom” Becomes MAVEN! I really want to make this today but I have no artichokes. Do you recommend a substitution or can I just carry on, following the recipe, without them? Any need to adjust the other quantities if they are absent? Kim, I made it tonight, my husband went ” it didn’t sound good but wow!” and i agree with him. thank you! It does not say when I should put the Artichoke. Can you tell me please? 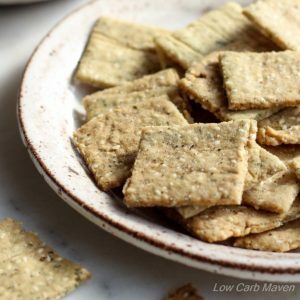 Do you have the recipe for the crackers/crispy bread in the picture?